Olde Forge Restaurant in Lanesboro. 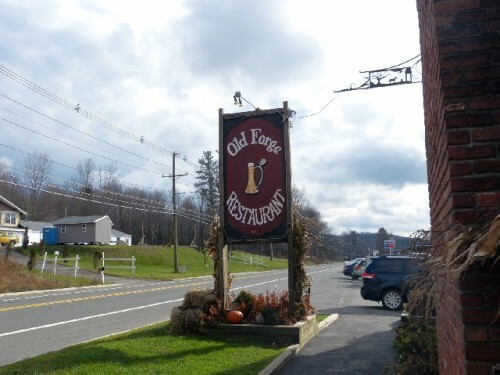 Chef/ Owner Kirk Grippo took over Old Forge Restaurant 15 years ago. 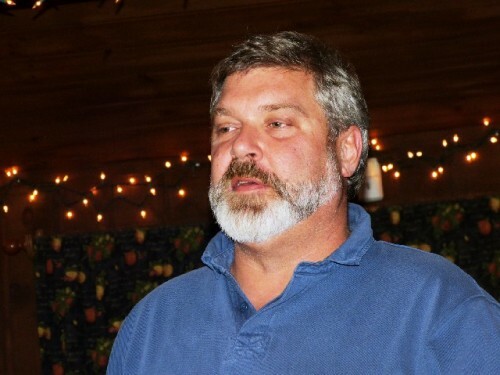 Chef Kirk Grippo has owned and managed the popular Berkshire Olde Forge Restaurant, in Lanesboro on Route 7, for the past fifteen years. He was in the back dining room setting up for a party that night. The Pit Bulls engaged him in a dialogue about the challenges of running a popular restaurant known for affordable, comfort food and an awesome selection of beers on tap and in bottles. Overall, this past summer was a good season. While most Berkshire restaurants struggle through the winter and mud months there is strong business from visitors to the nearby Jiminy Peak ski resort. During the Holidays Olde Forge hosts a lot of parties and catered events. Including the annual Festival of Trees for the Berkshire Museum. On any given weekend, year round, the pub is packed and lively. Cisco Can you talk with us about your remarkable selection of beers. Kirk Grippo I’m a classically trained chef. I went to Johnson & Wales University near Providence for its culinary arts program. I’ve cooked all over the county. I was the head chef for Williams College. I was the chef for Cranwell when it first opened. For the beers we try to keep a good balance. C How did you get into beer? KG I was always a food guy. I was president of the wine tasting club in college. We did a beer tasting way back then. In the early 1980s. When I came here I was looking for a restaurant and I found the menu interesting. So I ran with it. He (the former owner) had about 70 different beers at the time. C What about all the high end Belgian beers. The Chimays, for example, which are very expensive? KG I really felt that the area needed a place that gave you good food and good service with a comfortable environment. While keeping the prices as reasonable as possible. It’s really worked for us over the years. Right now everyone is feeling it. The prices are going up on everything everywhere. We’re trying to do things efficiently through restructuring. We made a mistake recently. For some beers, rather than raising the price, we served them in a smaller glass. That didn’t work. The regular customers didn’t want to hear that. We put it back in the regular glass. But all the price increases, we’re not putting them all on the customers. We try to make what we do more efficient. C What’s your cheapest beer? KG I honestly don’t know. There are still some in the $4.50 to $5 range. We don’t go higher than $8.50 unless we’re doing a special and expensive beer. We serve in a 14 ounce glass. Pancho Do you have Spaten Dark? KG We have it in bottles. Spaten is a keg beer that stays on tap all the time. Guinness stays on all the time. A lambic stays on all the time. You’ll see Speckled Hen on (the blackboard of current brews on tap) very often. Speckled Hen will run two kegs then we’ll put something else on. C So your inventory (200 plus bottled beers) has to be immense. C That’s like having an extensive wine cellar. KG Now with the seasonal beers we try to keep our beers coordinated with the right seasons. Right now we are still able to run Octoberfest. Pumpkin beers. I have to store them and you don’t want to store them too long. C For beers are you the Best in the Berkshire? KG I don’t like to call myself “The Best.” We just do what we do best. C Is there anyone else in the Berkshires? KG There’s Moe’s Tavern down in Lee. P For me, around here, the only thing that compares to Olde Forge is New York City. C The only problem appears to be coming here with my wife on Saturday night. KG Years ago we used to take reservations. We found that just made the waits longer. Right now we have a little dilemma with Powder Hound having a fire. It’s putting pressure on us so we’re waiting for them to reopen. They’re at the base of Jiminy Peak (ski resort). Worst case scenarios we might have gotten to 45 minutes a couple of weeks ago. That was a really busy weekend because there was so much going on in the area. C So it is usually about a half hour. KG Yes, normally about a half hour. C How many covers do you do in a night? C How many seats do you have? KG We actually hold in the winter time about 220. Ninety at the bar. In the summer time the deck adds another 45. C So you can turn a table on average three times in a night. KG Some nights we can do better than that. (laughs) People like to relax and sit and we don’t want to rush you. We can recognize who are the regulars, what types the groups are, and how long they’re going to sit. If it’s a family skiing we know they’re going to hang out longer. Two guys coming in for wings and beers, they’re in and out. Our hostesses are well trained. We work together and now there’s two of us. C How much staff do you have? C How many front of house? KG We have a staff meeting coming up. There’s eight bartenders. Eight bussing people. You can talk about 28 people working the restaurant on a Saturday. C So where are you? KG I’m all over. I work with everyone. Mostly front of the house. C Do you ever cook? KG Now I cook for special events. We train. We train each other. We come up with new recipes. We make our stocks. We really work as a group. The input of the front of the house staff is important to us too. We work as a group and adjust. If I have a waitress working on a section she won’t be left alone. We’ll be supporting her to get the food out. We’ll move the resources we have if, for example, the bar gets hit hard. The guys in the kitchen can come out and help us with a few things. We cross train everyone so we can help each other out. To get through the night. P By now your kitchen is well trained. KG The whole staff is. Knock on wood. A lot of us have been together for a lot of years. C You touch on a lot of the issues we have found in visiting and writing about restaurants in the Berkshires. Even in better restaurants there are issues with the consistency of the food and quality of service. C Do you get mostly a younger clientele? KG No. It’s very mixed. You can come in one night and it’s all young kids. Another night it’s older people, and another night it’s all mixed together. C This is not a destination for fine dining. KG We have good food. It’s a comfortable place. C What’s the difference between fine dining and good food? Compared to say Mezze, Allium or Blantyres. KG Mezze is a beautiful restaurant. I like that. KG No but we could cook like that. (laughs) We keep it within parameters. We prepare all our food from scratch. The mozzarella sticks are a prepared item. The chicken tenders are a prepared item. The potato skins come in frozen. Other than that we prepare all of our own food. Our dressings, our sauces, our stocks. It’s a little more comfort but we still have fun with our menus. There’s a Saltimbocca right now. (Veal Saltimbocca with prosciutto, provolone cheese and house demi glace $19.95). If we put a Scampi on the menu we would say Shrimp with Garlic Butter sauce. That way we are not being compared to another one and just preparing it the way we make it here. We had to reword all of our Tex Mex items on the menu because people were saying “They’re not Tex Mex.” We’re in New England (laughs). We’re not a Tex Mex restaurant but we offer that style because it hits on particular items that people like. We have a steak on the menu (Bone in NY Sirloin with sautéed wild oyster mushrooms and garlic, $23.95) because some customers just want to have a nice steak. It’s kind of a loss leader item like some of the Belgian beers. We don’t try to compete with anyone else. I mentioned Moe’s in Lee. We have a lot of customers in common. People like both places. C In season you do a lot of parties and events. KG We also do a lot of outside catering. We are getting ready for the annual Festival of Trees this weekend at the Berkshire Museum. We’ve done it for quite a few years now. It’s sort of a donation because we don’t charge that much. It’s a fun thing and I enjoy doing that. I cook for those events. It’s the showy part of what I do. I’ve been a caterer my whole life.